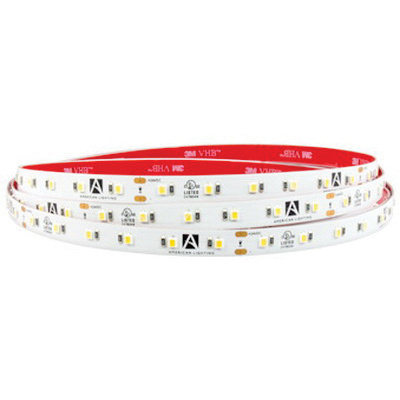 American Lighting Trulux Indoor LED tape light delivers ultra warm white light up to 285 Lumens/ft, with easy to work run lengths up to 22 ft. This 4.4-Watt/ft lamp has a color temperature of 2700K and CRI of 94 for superior color rendering. It features up to 50000 hour bulb life. The high output tape light is dimmable with most electronic low voltage (ELV) dimmers and is cuttable every 3.94-inches while maintaining cULus safety rating. It is suitable for edge lighting, task lighting, shelving, coves, staircases, toe kicks, railings and cabinetry. LED tape light is cULus listed.